If you like playing fetch (and, especially if you like playing it for hours), you’ll love having a Golden Retriever. Eager, loving, intelligent and playful, these dogs have boundless energy and very few behavior problems. Golden retrievers are loaded with confidence and good vibes. They are not particularly aggressive, territorial, manipulative or destructive. However, like Labrador Retrievers, they can be a little boisterous and intense as puppies, chewing furniture and retrieving an endless assortment of unwanted objects. Not to worry: These traits will mellow after a few years. The best way to manage this hyperactivity is to keep them running. Golden Retrievers love to play outdoors, swim and fetch balls and sticks, not to mention roll around in the mud. And they’re always game for a cross-country run or to follow you during a bike ride. 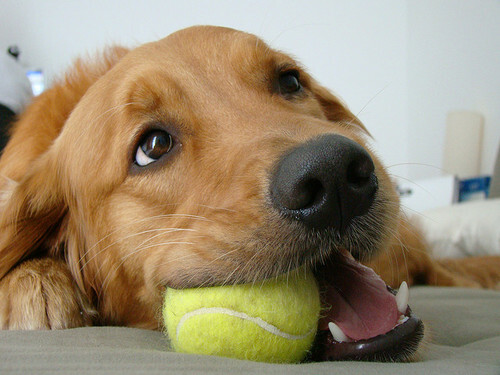 Goldens love to carry things around in their mouths – and not just tennis balls. If they find something they like, e.g., a stick, a toy or a shoe, they’ll carry it around for days. Inevitably, these objects will become very slobbery. Not the best guard dogs, Golden Retrievers are friendly and wide-eyed with strangers. But, they have been known to bark once or twice when someone comes to the door. Golden Retrievers love tasks and challenges. They are also quick learners and eager to please. But, keep in mind: Goldens will keep going until they collapse. Be sure to monitor their fatigue levels, whether they’re hunting, retrieving or performing obedience trials. Never the types to fixate on a single person, Goldens get along with the whole family and are especially patient and outgoing with children. However, a high-energy Golden Retriever (especially a young one) can accidentally bump into or knock over a child during play. 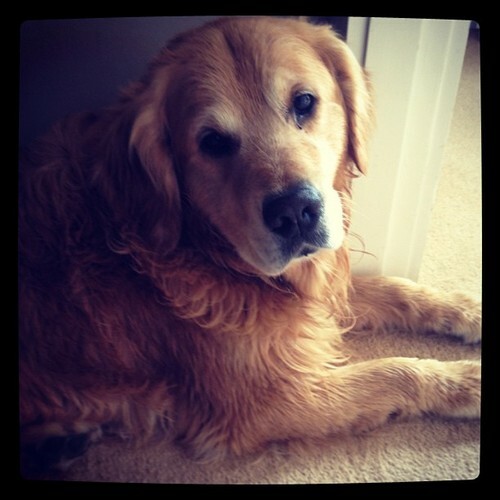 Like most dogs their size, Golden Retrievers normally live between 10-12 years. Common health problems include hip dysplasia and skin allergies. Plenty of exercise and moderate rations of food will keep them healthy for years to come. In 19th century Scotland, a surplus of waterfowl and game—along with improvements in long-range firearms—created the need for sturdier and more powerful retrievers for the region’s avid hunters. Golden Retrievers were the result, bred from a mix of retrievers, setters, spaniels and bloodhounds. First registered as “Flat Coats – Golden” by England’s Kennel Club in 1903, they eventually received AKC recognition in 1925 and are today one of the most popular breeds in America. Golden Retrievers are instantly recognizable by their beautiful golden-brown coat, balanced proportions and outgoing smile. A typical Golden Retriever’s broad head has a wide but tapered muzzle, a brown nose, gentle brown eyes and medium-sized pendant (hanging) ears. A sturdy neck, muscular shoulders and broad chest lead to strong thighs. Their long tails do not curl. Their coats—dense and water-resistant—can be flat, wavy or feathered. Colors can range from cream to golden brown.